This is a long overdue post. Some time back--years maybe--I saw an online encyclopedia called "Native American Encyclopedia." It is on Twitter, and Instagram, and no telling where else, but if you start looking carefully---and by that I mean critically---at the content, its legitimacy goes downhill fast. Who curates the content? Posts have personal names, like Carol, or Alice, but no last names. Who are they? What is Carol's expertise? What is Alice's expertise? The "About" page uses "our" elders, etc., which suggests that the curators are Native. It even says that it is "Native owned and operated" but who are the Native people that own and operate it? In a tweet earlier today, I said I thought perhaps the curator is a robot because there is SO MUCH on the site! Check out a page. You pick the page. Maybe the "Native American Zodiac" page. Wait. Native American zodiac?! As if all 500+ tribes are the same and have a zodiac that we all use?! Or maybe the page about naming, that tells you a naming ritual starts with "Harken!" As if Native people use words like "harken" in our rituals. Or maybe the page about Cherokee, that is full of past tense verbs. As if the Cherokee don't exist anymore? If you're a regular reader of American Indians in Children's Literature, you know that I recommend you visit websites of Native Nations. On this bogus Native American Encyclopedia site, the source of info on the Cherokee people is a website called "The Wild West." Not ok! What page did you choose? Are you looking at it now? On the page you've chosen, scroll down to the bottom to see what it says about its source. The sources are definitely questionable. The one for the owl of the zodiac, for example, tells us the source is "xtraastrology." Let's pause there. Are you a teacher? A librarian? A parent? You know that source matters, right? Scroll down a bit more. See those tiny grayed out words that say "Based on the collective work of NativeAmericanEncyclopedia.com" that are followed by the copyright symbol, saying that Native American Encyclopedia holds the copyright for the page? I wonder if The Wild West site is ok with the Native American Encyclopedia copyrighting their content? Two big indicators that the people who create and use that site are pretty misinformed about who Native peoples are... First, the site administrator has a sidebar that lists the pages that have been "favourited" a lot. See the spelling of favorite? With that u? That's how it is spelled in Europe. Does that tell us that the curators for the site are in Europe?! And second, the page most often favourited is the zodiac one. Selecting that page reveals the ignorance of the person choosing it as a favorite! Please don't use this site, and if you're interested in information about Native Nations, tell others not to use the site either. Tell them why, too. And then, look for the website of a specific nation. Use Lisa Mitten's page, Native Nations, to find one. She is a mixed-blood Native who was president of the American Indian Library Association. Or, look at a credible site, with experts. A good place to start is the National Museum of the American Indian. Good information is available. Don't be duped by sites like "The Native American Encyclopedia." Skip it. A few years ago, Oyate had a list of books about Thanksgiving that they did not recommend. The list was on their website. Given the number of books that are published every year about that holiday and the ways that Native peoples continue to be misrepresented in children's books, you would be right to guess that their list is long. That list is not at their website any longer. In a redesign a few years ago they decided to remove it and their Books to Avoid section. They decided that, although a list might seem efficient, it didn't give people the critical thinking skills they need to develop in order to make decisions on their own. I agree--I'd prefer people develop those skills and apply them their selection/deselection activities. On the other hand, teachers use lists of good books all the time. Generally speaking, they assume that the person who put that list together has the expertise necessary such that their evaluations can be trusted. I personally have not read all of these books, but I definitely learned a great deal from Oyate's work. I strongly encourage teachers and librarians to get materials published by Oyate. My guess is that I'd concur with their decision about each of these books, and I'd also guess that any given book on the list got there because it put forth one or more of what Judy Dow and Beverly Slapin called myths in their Deconstructing the Myths of the First Thanksgiving. If one of these books is on your shelf and you're considering weeding it, I recommend you read it and Dow and Slapin's essay and then make a decision. Own your knowledge. Own your decisions. Accorsi, William. Friendship's First Thanksgiving. Holiday House, 1992. Aliki. Corn is Maize: The Gift of the Indians. Harper & Row, 1976. Anderson, Laurie Halse. Thank You, Sarah: The Woman Who Saved Thanksgiving. Simon & Schuster, 2002. Ansary, Mir Tamim. Thanksgiving Day. Heinemann, 2002. Apel, Melanie Ann. The Pilgrims. Kidhaven Press, 2003. Bartlett, Robert Merrill, The Story of Thanksgiving. HarperCollins, 2001. Barth, Edna. Turkeys, Pilgrims, and Indian Corn: The Story of Thanksgiving Symbols. Clarion, 1975. Borden, Louise. Thanksgiving Is... Scholastic, 1997. Brown, Marc. Arthur's Thanksgiving. Little, Brown. 1983. Bruchac, Joseph. Squanto's Journey: The Story of the First Thanksgiving. Harcourt, 2000. Buckley, Susan Washburn. Famous Americans: 15 Easy to Read Biography Mini-Books. Scholastic, 2000. Bulla, Clyde Robert. Squanto, Friend of the Pilgrims. Scholastic, 1990. Celsi, Teresa. Squanto and the First Thanksgiving. Steck-Vaughn, 1989. Clements, Andrew. Look Who's in the Thanksgiving Play! Simon & Shuster, 1999. Cohen, Barbara. Molly's Pilgrim. Lothrop, Lee & Shepard, 1983. Conaway, Judith. Happy Thanksgiving! Things to Make and Do. Troll Communications, 1986. Crane, Carol and Helle Urban. P is for Pilgrim: A Thanksgiving Alphabet. Sleeping Bear Press, 2003. Dalgliesh, Alice. The Thanksgiving Story. Scholastic, 1954/1982. Daugherty, James. The Landing of the Pilgrims. Random House, 1987. Davis, Kenneth C. Don't Know Much About the Pilgrims. HarperCollins, 2002. DePaola, Tomie. My First Thanksgiving. Putnam, 1992. Donnelly, Judy. The Pilgrims and Me. Grosset & Dunlap, 2002. Dubowski, Cathy East. The Story of Squanto, First Friend to the Pilgrims. Dell, 1990. Fink, Deborah. It's a Family Thanksgiving! A Celebration of an American Tradition for Children and their Families. Harmony Hearth, 2000. Flindt, Myron. Pilgrims: A Simulation of the First Year at Plymouth Colony. Interact, 1994. Fritz, Jean. Who's That Stepping on Plymouth Rock? Putnam & Grossett, 1975. George, Jean Craighead. The First Thanksgiving. Puffin. 1993. Gibbons, Gail. Thanksgiving Day. Holiday House, 1985. Gibbons, Gail. Thanksgiving Is... Holiday House, 2004. Greene, Rhonda Gowler. The Very First Thanksgiving Day. Atheneum, 2002. Hale, Anna W. The Mayflower People: Triumphs and Tragedies. Harbinger House, 1995. Hallinan, P. K. Today is Thanksgiving! Ideals Children's Books, 1993. Harness, Cheryl. Three Young Pilgrims. Aladdin, 1995. Hayward, Linda. The First Thanksgiving. Random House, 1990. Hennessy, B. G. One Little, Two Little, Three Little Pilgrims. Viking, 1999. Jackson, Garnet. The First Thanksgiving. Scholastic, 2000. Jassem, Kate. Squanto: The Pilgrim Adventure. Troll Communications. 1979. Kamma, Anne. If You Were At... The First Thanksgiving. Scholastic, 2001. Kessel, Joyce K. Squanto and the First Thanksgiving. Carolrhoda, 1983. Kinnealy, Janice. Let's Celebratae Thanksgiving, A Book of Drawing Fun. Watermill, 1988. Koller, Jackie French. Nickommoh! A Thanksgiving Celebration. Atheneum, 1999. Marx, David F. Thanksgiving. Children's Press, 2000. McGovern, Ann. The Pilgrims' First Thanksgiving. Scholastic, 1973. McMullan, Kate. Fluffy's Thanksgiving. Scholastic, 1997. Melmed, Laura Krauss. The First Thanksgiving Day: A Counting Story. HarperCollins, 2001. Metaxas, Eric. Squanto and the First Thanksgiving. Rabbit Ears Books, 1996. Moncure, Jane Belk. Word Bird's Thanksgiving Words. Child's World, 2002. Ochoa, Anna. Sticker Stories: The Thanksgiving Play. Grosset & Dunlap, 2002. Osborne, Mary Pope. Thanksgiving on Thursday. Random House, 2002. Parker, Margot. What is Thanksgiving Day? Children's Press, 1988. Peacock, Carol Antoinette. Pilgrim Cat. Whitman, 2004. Prelutsky, Jack. It's Thanksgiving. Morrow, 1982. Randall, Ronnie. Thanksgiving Fun: Great Things to Make and Do. Kingfisher, 1994. Raphael, Elaine and Don Bolognese. The Story of the First Thanksgiving. Scholastic, 1991. Rau, Dana Meachen. Thanksgiving. Children's Press, 2000. Roberts, Bethany. Thanksgiving Mice! Clarion, 2001. Rockwell, Anne. Thanksgiving Day. HarperCollins, 1999. Rogers, Lou. The First Thanksgiving. Modern Curriculum Press. 1962. Roloff, Nan. The First American Thanksgiving. Current. 1980. Roop, Connie and Peter. Let's Celebrate Thanksgiving. Millbrook, 1999. Roop, Connie and Peter. Pilgrim Voices: Our First Year in the New World. Walker, 1995. Ross, Katherine. Crafts for Thanksgiving. Millbrook, 1995. Ross, Katherine. The Story of the Pilgrims. Random House, 1995. Ruelle, Karen Gray. The Thanksgiving Beast Feast. Holiday House, 1999. San Souci, Robert. N.C. Wyeth's Pilgrims. Chronicle, 1991. Scarry, Richard. Richard Scarry's The First Thanksgiving of Low Leaf Worm. Little Simon, 2003. Schultz, Charles M. A Charlie Brown Thanksgiving. Simon & Schuster, 2002. Sewall, Marcia. People of the Breaking Day. Atheneum, 1990. Sewall, Marica. The People of Plimoth. Aladdin, 1986. Sewall, Marcia. Thunder from the Clear Sky. Atheneum, 1995. Siegel, Beatrice. Fur Traders and Traders: The Indians, the Pilgrims, and the Beaver. Walker, 1981. Siegel, Beatrice, Indians of the Northeast Woodlands. Walker, 1992. Silver, Donald M. and Patricia J. Wynne. Easy Make and Learn Projects: The Pilgrims, the Mayflower & More. Scholastic, 2001. Skarmeas, Nancy J. The Story of Thanksgiving. Ideals Publications, 1999. Sorenson, Lynda. Holidays: Thanksgiving. Rourke, 1994. Stamper, Judith Bauer. New Friends in a New Land: A Thanksgiving Story. Steck-Vaughn, 1993. Stamper, Judith Bauer. Thanksgiving Fun Activity Book. Troll, 1993. Stanley, Diane. Thanksgiving on Plymouth Plantation. HarperCollins, 2004. Steigemeyer, Julie. Thanksgiving: A Harvest Celebration. Concordia, 2003. Tryon, Leslie. Albert's Thanksgiving. Aladdin, 19983. Umnik, Sharon Dunn (Ed.). 175 Easy-to-Do Thanksgiving Crafts. Boyds Mills Press, 1996. Waters, Kate. Giving Thanks: The 1621 Harvest Feast. Scholastic, 2001. Waters, Kate. Samuel Eaton's Day: A Day in the Life of a Pilgrim Boy. Scholastic, 1993. Waters, Kate. Sarah Morton's Day: A Day in the Life of a Pilgrim Girl. Scholastic, 1989. Waters, Kate. Tapenum's Day: A Wampanoag Boy in Pilgrim Times. 1996. Weisgard, Leonard. The Plymouth Thanksgiving. Doubleday, 1967. Whitehead, Pat. Best Thanksgiving Book, ABC Adventures. Troll Communications, 1985. I did a post for the We Need Diverse Books page. Below is a screen capture. Please go read it. It has the kind of info that I want to feature in the chat next week. Allie Jane Bruce, by the way, is the kind of librarian that I wish was in every library, every school, around the world. Yes. The world. 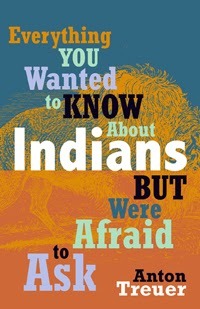 Anton Treuer's Everything You Wanted to Know about Indians But Were Afraid to Ask is one of the books I think every teacher ought to have on her shelf, and that every library ought to have, too, in multiple copies. Published in 2012 by the Minnesota Historical Society Press, the information in Treuer's book is presented in a question/answer format. If you've already got Do All Indians Live in Tipis from the National Museum of the American Indian (NMAI), add this one to your shopping cart or order form right away. Though there is some overlap (both, for example, discuss use of "American Indian" versus "Native American"), there are definitely a lot of things that are not in the NMAI book, and, because Treuer is Ojibwe, we get more depth on that nation, in particular. The contents of the book are in question/answer format, with the questions ones that Treuer is asked in lectures and workshops. He's the executive director of the American Indian Resource Center at Bemidji State in Minnesota. In History, Treuer addresses the land bridge theory of the continent's first inhabitants by pointing to new research of archeological sites that forces us to reconsider that theory. He also answers the oft-posed question "why does it matter" when Indians got here. He says that the question itself is one whose subtext is that everyone is immigrant to this continent, and as such, is an attempt to undermine Native Nations. If your great-grandmother was Cherokee, then one of your grandparents was too, and one of your parents, and in actuality you are Cherokee as well. Someone who truly identifies with his or her native ancestry will say, "I am Cherokee." He goes on to say that the "my great grandmother" statement, though well-intended, demonstrates a level of ignorance about Cherokee history and culture, and posits that those who have actually investigated that family story and Cherokee culture would come away saying "I'm Cherokee" (if the story is legitimized) and would abandon the "princess" claim because it is not valid. If you want to make your classroom, school, or library more welcoming to Native peoples, signage is a good option. A couple of years ago, I pointed to a number of resources you can turn to do that. If you've got a choice, I encourage you to get Everything You Wanted to Know about Indians But Were Afraid to Ask from an independent bookstore like Birchbark Books. I like Treuer's book. He writes directly and conveys nuances to, amongst the 500+ federally recognized tribal nations. I highly recommend you add it to your collections.